Over the years, I’ve given cats pills hundreds of times. This hasn’t always been a good experience — for me or the cats! These are some of the tricks I’ve learned for giving a cat a pill, sometimes by trial and error and sometimes by just trying to think like a cat. But first, a word about pills. When given a choice, I prefer liquid medication. The cat can’t spit it out when I’m not looking. And pills are difficult for a cat to swallow. Pills tend to get stuck in the cat’s esophagus and can stay there for as long as 15 minutes, causing a painful and sometimes dangerous burning sensation. If giving a cat a pill is your only choice, follow it with a few bites of wet food or a chaser of water in a syringe. If your cat is going to be on medication for life, ask your veterinarian for medicine that’s been compounded into liquid that tastes good to cats, soft moist treats or a gel that you’d rub inside an ear flap. Most cats also love Medi-Melts, tiny pills that melt in the cat’s mouth and taste like treats. Don’t take no for an answer! You and your cat have to live with each other, and if you have a major struggle over medicine twice a day, he’s soon going to decide he hates you or is terrified of you. If you don’t have a compounding pharmacy in the town where you live, you’ll find many good ones online. If giving a cat a pill is the only option, here are some ways to disguise pills. But cats aren’t easy to fool. One disguise may work for a while. But eventually, your cat will probably catch on, and you’ll need to try another. 1. Pill Pockets. The capsule size Pill Pockets for dogs seem to work best because they have a stronger smell. Break off just enough of the Pill Pocket to cover the pill so the cat will swallow it instead of biting into the “treat” and getting the bitter taste of the medicine. Also, make sure the Pill Pocket is fresh and smelly. If you’re getting down to the end of the bag, microwave the Pill Pocket to make it smelly again. Along with the Pill Pocket, give your cat a few treats. He should eat the Pill Pocket while he’s eating the other treats. 2. Sandwich the pill into a soft moist treat. Even if the pill falls out of the treat, the cat might eat the pill because it tastes like the treat. Or, cut a treat with a soft center in half, put the pill into the soft center and reassemble the treat. 3. Hide the pill in just a bite of food. Most cats know when their food has been tampered with and won’t eat it, so use something your cat doesn’t eat all the time. Turkey, chicken and ham baby food also make great disguises for pills. So does a little bit of tuna. Try hiding a whole pill in the food first. If your cat eats around the pill, dissolve it in a couple of drops of water and mix it into the food. Give him only as much food as he can eat in a couple of bites. If he doesn’t finish it all, he won’t have gotten all of his medicine. 4. Some cats will eat a pill in a tiny bit of plain yogurt or vanilla ice cream. 5. Wrap the pill in a “treat food,” like liverwurst, cream cheese, white American cheese or Monterrey Jack. 6. Fancy Feast Broths have a strong smell that disguises the pill, and most cats love them. Use different flavors so your cat doesn’t get bored with one. 7. Hide the pill in a bite of Underwood Deviled Ham. If you decide to try the straightforward approach to giving a cat a pill, this is the way that works best for my cat friends and me. Dip the pill in a little bit of wet food so it will be easier to swallow. You can also use butter, but a buttery pill is slippery and hard to hold on to. Sit on the floor with the cat and wrap your legs around the him while petting his head or scratching his neck. If he’s the kind of cat who will swat at you just for the fun of it, sit with his back to you and press your knees around him. Tilt his head back, open his mouth and drop or gently toss the pill into his mouth just beyond the hump in his tongue. Let him close his mouth. Do this quickly! Rub his throat or blow gently in his face to make him swallow. Opening his mouth just a little bit will also make him swallow. While you’re doing this, tell him what a smart cat he is to take his medicine because it will make him feel much better. The second he swallows the pill, give him some treats or something he likes to eat to show how much you appreciate his cooperation. A reward will make medicating him next time easier. 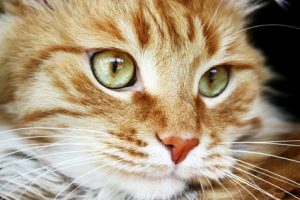 If your cat is on several different kinds of medication, consider putting all of his pills in one empty gelatin capsule coated with butter or wet food. He’ll appreciate getting the medication over with in one gulp. When buying gel caps, higher numbers are smaller capsules. The smallest capsules are size four. The largest are size 000. Giving a cat a pill without causing a lot of trauma and stress for both of you is possible. Just be patient, gentle and treat your cat like he’s a partner in his health care. Of course, sometimes you might have to be creative, too!